An unusually charming Poverty Row Western with a starling, unique supernatural image: skeletal riders paroling the prairie on skeletal horses. "The Vanishing Riders" is a better-than-average Poverty Row Western, a product of the Ray Kirkwood Productions, which existed mostly to make Westerns starring Bill Cody. The St. Paul-born Cody just coincidentally shared a name with Buffalo Bill Cody, which was enough to get you a film career in the early days of of Hollywood. But Cody was a likeable lead, competent at all the cowboy stuff he was required to do and seemingly charmed by everyone he shared the screen with — he spends a lot of his screen time looking at other actors and grinning at what they do. Eventually he was paired with his own son, Bill, Jr., who was a terrific actor who seemed like he might mature into a genuine leading man, but whose film career seems to have mostly been waylaid by traumatic experiences in World War II. Father and son made a series of films together, and this seems to have been the only one with a supernatural theme, although it barely has one; I'll get to that in a moment. The film is directed with a surer hand than you usually find in these sorts of low-budget, independent oaters; it was helmed by Robert F. Hill, who had a long career as actor and director in the silent era. He goes so far as to include b-footage of cowboys moving cattle around, which doesn't seem like it's a lot, but this is literally the only Poverty Row Western I have seen that has demonstrated that cattlemen had cattle. The story has a brief prelude in which Cody, Sr., as a lawman, kills a badman, who turns out to be the father of Cody, Jr. who the elder Cody than adopts. One presumes this was done in order to explain the fact that Cody, Sr. does not have a wife in the film, but it gives Jr. a bravura scene in which he both weeps copiously and scolds another criminal for his role in dad's death. We then fast-forward a year. Cody, Sr. has retired from the law, and he and his now-adopted son just sort of wander the range. They visit an abandoned mining town, abandoned but for an eccentric old coot played by Budd Buster, a veteran vaudevillian who was so adaptable to Western types that he once appeared in 32 films in one year. He plays the coot well, with all the high-voiced jawboning mannerisms we associate with an old miner, and a few surprising ones. First, he tends to just jabber about all the people who have committed suicide in his town, which is supposed to be haunted. Second, he greets the Bill Codys with a volley of gunfire until Jr. takes him down with a series of rooftop stunts that were probably dangerous enough that the kid shouldn't have performed them. He explains that there are rustlers about — specifically, Wolf Lawson, which is a pretty dramatic name for a character who, when we meet, has the trimmed mustache, tucked necktie, and slightly hysterical, bullying mannerisms of a military lieutenant who gets murdered by his own men, played by Hal Taliaferro. Lawson has put together a gang of mostly incompetent, deeply superstitious rustlers, and they have been harassing a local ranch owner, played by Ethel Jackson, who barely has anything to do but look pretty — it's an irritating convention of old Westerns that while women may sometimes own ranches, they rarely have a hand in the running of it, and any problems they have will be solved by gallant cowboys. In this instance, things get worse before they get better. 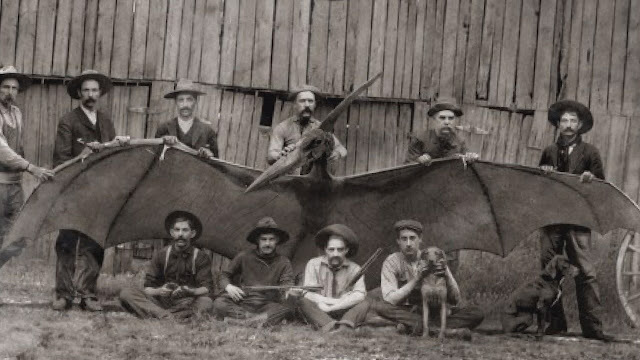 The coot miner stumbles across Lawson's gang after hearing them sing cowboy songs in the hills and, not knowing who they are, actually hires them to work on Jackson's ranch. Codys Sr. and Jr. and both suspicious of Lawson, who has taken to calling himself by an obvious alibi: Joe Smith, or something like that. When Lawson finally kidnaps Jackson and makes plans to ride off with her cattle, that's when the Codys decide to act on the superstitions of the rustles. 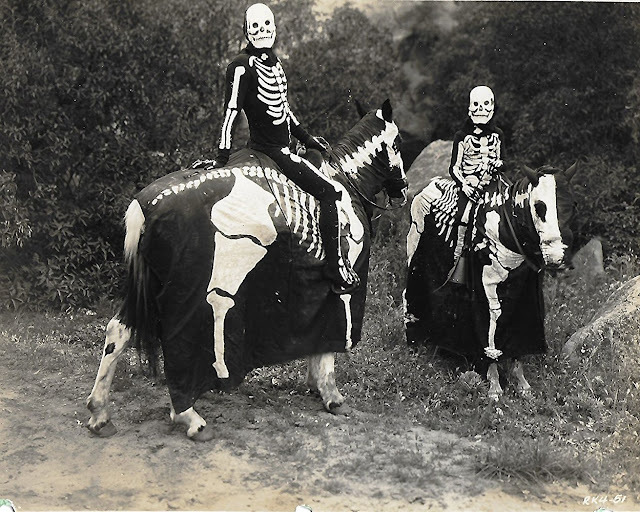 So they dress up as skeletons, and dress their horses as skeletal horses, and then just creep around. Every time they spook a rustler, they chase him down and punch him out, and this works. Eventually it comes down to Lawson, who Cody Jr. manages to drag off his horse, hog tie, and then drag back to the ranch behind his own horse as though there was nothing to capturing a desperado. Truthfully, the skeleton costumes, which consist of white paints on black body suits, aren't tremendously convincing. They are, however, oddly effective; if the Codys don't look like actual ghosts (or "haunts," as the villains call them), the do look like they might be part of some Western death cult, riding the range in search of victims. The superstitious villains are often weirdly hilarious: Two of them have a long discussion about a previous ghost they met, who joined them in playing cards and turned out to be a rather likeable sort, which is a much weirder moment than the film really required. Sometimes you hear about a film coasting on charm; this doesn't precisely coast, because that suggests it has more resources but decided to be a bit lazy because it knew it would be forgiven. I don't think there was a resource that went unspent on the film, but it does foreground its charm, which is both the cheapest and most abundant commodity it has. The dialogue is often genuinely fun, and Cody, Jr. has a delightful habit of slowly pushing his hat forward when making a sardonic comment, like he knows he's being rakish. It's more than this sort of film required, and more than Poverty Row Westerns usually delivered. And its central image, of skeletal horsemen riding skeletal horse, is a singular one; I don't recall having seen it before or since. There's not much supernatural about the film, and yet it produced a unique, supernatural image that feels somehow iconic. Even big budget films rarely do that, and never with such charm.